The center point is the system's barycenter; it's sort of the system's collective center of mass. This point is what any system's objects, planetary and stellar scale alike, orbit around, just in most cases the point is inside a more massive object, rendering it almost static, while the less massive objects orbit around it. If both planets were orbiting on each other, it would look a lot different. 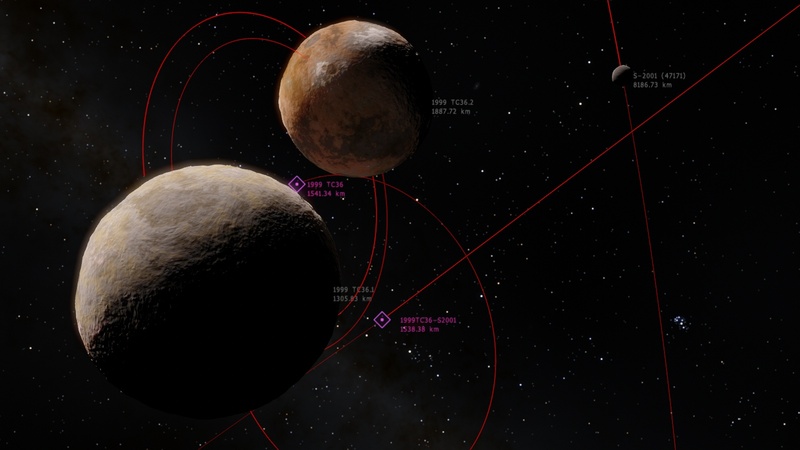 But the way it is in the picture, with the circular orbits being so close to each other, and with the barycenter far from either planet, is compatible with a third, more massive body at the center. But there clearly is none. If they were orbiting on each other, one of them would occupy the center of orbit or close to it, like Pluto is doing in the gif of the Wikipedia article you pointed out. But the way it is in the picture, with the circular orbits being so close to each other, and with the barycenter far from either planet, is compatible with a third, more massive body at the center. No, you're wrong. VERY wrong. Where the barycenter is located relative to the objects is simply a function of their relative mass. If they have nearly equal mass, the barycenter will be almost exactly between them. If they have very unequal mass, the barycenter will be closer to one object than the other. As much as counter-intuitive it seems, I don't see nothing wrong in those orbits. Those planets have comparable mass, and their semi-major axis is a consequence of it. Their relative distance is conserved, they're effectively "falling" one towards the other. If there were an object in place of the barycenter the total mass of the system would be different, and so the orbits and relative orbital velocities. But maybe I've missed something. 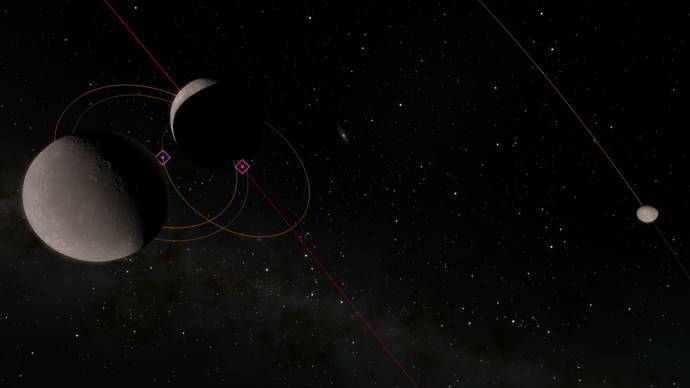 My bad guys, I just realized, after going back to SpaceEngine and time-forwarding the simulation, that both planets orbit the barycenter at exactly the same relative speed, meaning they're always perfectly opposite to each other in the orbit. I was under the impression that their speeds were different, so that they'd get very close to each other eventually, invalidating their circular orbit. I should have watched the orbit in time carefully before reporting it. Sorry! For people who do not want to wait for the next SE version. But it looks a bit different. 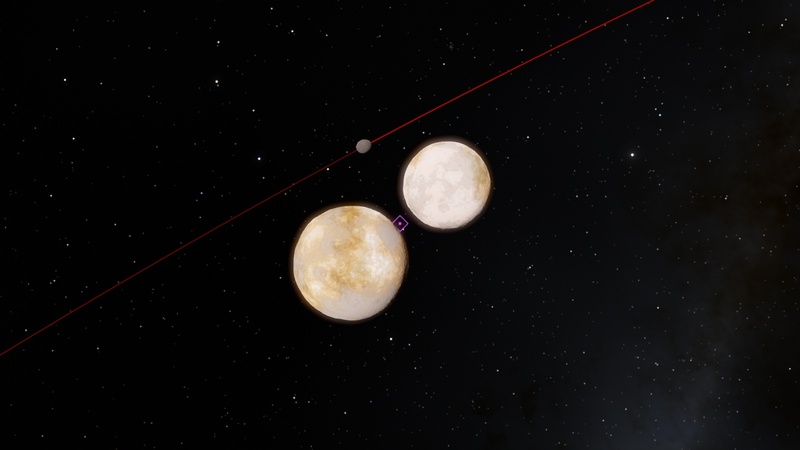 Shouldn't the moon slightly offset the binary to form a secondary barycenter, like in a trinary system? As far as I understand, it doesn't form another one; it just bends the position of the existing barycenter towards it slightly, naturally also altering the other objects' orbits. Having two barycenters would seem to be against the reason we even define one. You can't have more than one "center point," right? Correct me if I'm wrong, though. I think it is done that way. Small correction at the script. Technically, every object that orbits with every other object should have a barycenter. But if their mass ratios are skewed enough, you can just ignore that since the practical effect is minimal. Just like how the vast majority of objects in SE don't have barycenters, even though if you want to be TECHNICALLY correct they should have these crazy dynamic barycenters dancing around the center of the primary body. But we ignore this since it just doesn't make a difference. In this case - yes, adding next baryceneter in hierarchy must made model of three bodies motion more accurate. 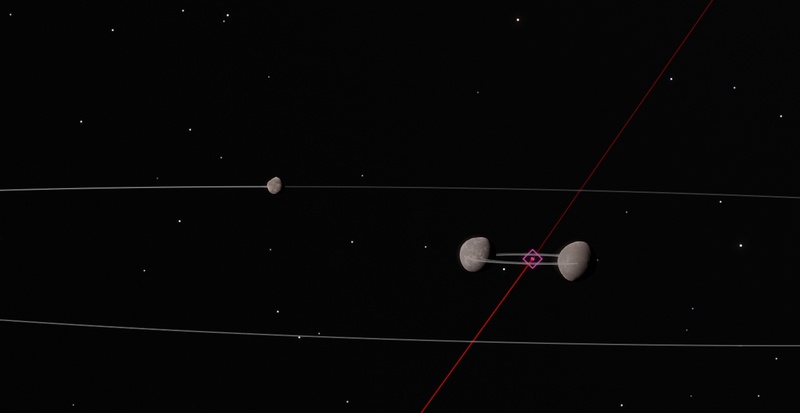 In other cases, like for asteroid Sylvia with 2 moons, this is not possible. Or in the case of Sun-Jupiter barycenter, taking into account presence of another planets. You simply can't point out the correct hierarchy of the barycenters, each model will have bigger errors compared to simple Keplerian orbits around Sun's center. The moon is in wrong position relative to the "primary binary" barycenter. Technically any object with mass has an infinite, although quickly diminishing gravitational reach, so shouldn't you take every single object in the simulated universe and calculate their barycenters with every single other object? Way to make a simulation take up several supercomputers worth of processing power, if nothing else. How do I add surface objects again? I can't find the instructions. Is it possible to place them by latitude and longitude coordinates?